One-offs and unique collaborations are the BBC’s USP for the Electric Proms but the festival also brings the best out of music’s legendary figures, convinced it seems to pull out all the stops for Auntie. A visibly frail James Brown summoned up an awe inspiring 2 and a half hour set for what turned out to be his final UK appearance. This year Burt Bacharach is the Proms “Legend” although one comment posted on the This Is London website enquired at what point a ‘naff middle of the road artist becomes a legend?‘ Paul Gambaccini – a perhaps more respected and respectful commentator – introduced Burt to the crowd with a long loving speech, finally declaring him ‘the man who gave melody to the second half of the 20th century‘. That man strolls on relaxed with one hand in pocket looking impossibly cool, dapper, and a good 20 years shy of his 80 something vintage. A burst of what has become – post Austin Powers rehabilitation – his theme tune ‘What The World Needs Now‘ announces the presence and power of the 50 strong BBC Concert Orchestra behind him. ‘Good Evening’ says Bacharach, before chuckling as those right up the front overcome perhaps by the intimacy of the venue politely respond with ‘Good Evening’ back. Yes, Burt you’re in England now. ‘All the songs you’re going to hear this evening’ he says have one thing in common ‘they were written by the same person… the piano player here’. He’s come along way since Marlene Dietrich signed him up as her piano player and arranger in the mid-1950s. Together with, as Bacharach dubs him, ‘the brilliant’ Hal David he’s featured in the charts for five decades clocking up 70+ US Top 40 hits, and a dozen number ones. A magical night in store then? Well, mostly yes… utterly magical but a mixed bag in places too. The first gripe takes place with the announcement of the first song… ‘Now the first of a series of extended Medley’s throughout the evening’. I bloody hate medleys!! 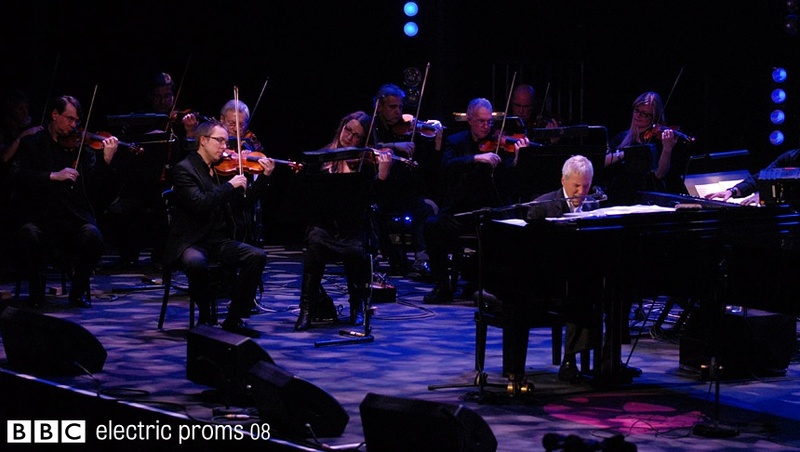 You could argue that Bacharach has written so many classics that playing them all in full would take so long he could open and close the Proms with one gig. Its impossible not to be frustrated hearing several of the greatest songs of all time (‘Walk On By’ and ‘Say A Little Prayer’) skimmed past so quickly they’re over not long after the rapturous applause as the audience recognises each one dies down. For the first medley (Dont Make Me Over, Walk On By, This Guy’s In Love With You) the strings were slightly lost in the mix, but by the time ‘I Say A Little Prayer’ started another medley the string section was a joy to hear. On ‘Trains and Boats and Planes’ they were simply gorgeous. Bacharach – ever the perfectionist – washalf sat playing the piano, while simultaneously conducting the orchestra with one hand. At 5 foot 8 inchs Bacharach towered over his first ‘special guest‘ of the evening, the ‘very talented young man‘ Jamie Cullum. I wouldn’t put myself down as a fan, but credit where its due, Cullum was excellent. He brought a real star quality and an assured vocal to ‘Make It Easy On Yourself‘ delivering the line ‘breakin’ up is so very hard to do‘ with true emotion. Poor Beth Rowley has taken the brunt of the harshest comments from reviewers, ‘sounding like a pub singer‘ covering ‘Twenty Four Hours From Tulsa‘ according to The Guardian while The Times mocked her ‘hitting some of the notes more in hope than expectation‘. She did seem to struggle with some of the notes but I thought she brought a bit of rawness to an otherwise very slick show. Adele has since said it was a ‘dream come true‘ to perform with Bacharach and the way she bounded on stage betrayed that as well as revealing her to be undaunted at covering Shirelles / The Beatles ‘Baby Its You‘. Im not sure its possible to steal a show when you’re on stage for barely 3 minutes but with a warmth, sense of fun and of course that wonderful rich voice she came close. As she belted out ‘Can’t help myself…‘ it was as if the song was written for her. In total the guest stars were on stage for less than 10 minutes of the 90 minute show, with Bacharach content to leave most of the vocals to the row of three singers who travel the world with him. Whilst all three are undoubtedly fine singers, Bacharach’s material has been sung by such a range of classic voices from Springfield, Warwick, Franklin or Jones that to hear it all delivered by just three almost constantly seated backing singers strips some of the magic away. I never thought I’d say it but I longed for the return of Jamie Cullum or the other special guests, all of whom would have all jumped at the chance to tackle one more song. Sitting down to sing is just wrong anyway, if Donald Rumsfeld can stand all day while rubber stamping torture then singers should at least stand when delivering one of the classic songbooks of the 20th century. It’s no coincidence that when Josie James gets up off her stool ‘Anyone who had a heart‘ the audience is left with collective goose-bumps (YouTube). As if to prove that even at 80 he’s not just trading on nostalgia Bacharach debuts some new material, although he introduces the track a song too early in the set. His trio of singers who’d departed on his cue, shuffling back on stage… ‘Next time, tell me‘ a laughing Burt chastises. He also warns the unpromisingly titled ‘For The Children‘ is a different kind of style from what people may expect from him. Brief thoughts that Bacharach might have tried his hand at Gabba or Hard House quickly dissipate as ‘For The Children‘ is revealed as a beautiful string laden instrumental. It’ll be a perfect movie soundtrack, but its subtleties are obscured by the general hubbub of the Roundhouse. Stood just outside the central circle much of the evenings more delicate moments disapeared into the bottle clanking racket of the bar behind and the loud chit-chat of people seemingly not there to actually hear one of the all time greats. It’s not often you wish for London’s stabbing problem to claim a couple of extra victims before ceasing. Burt Bacharach is famously self deprecating about his own voice, in this classic Youtube clip he’s asked ‘who do you sing like Burt? ‘Beethoven‘ he answers… but Beethoven wasn’t a singer the questionnaire points out…‘Thats right‘ deadpans Burt. His rumpled baritone may have seen better days but it remains a wonderfully effective instrument, particularly on the half whispered but undeniably poignant ‘Alfie‘. Sung by Cilla Black for the UK version, and Cher in the US, Alfie is just one of Bacharach’s soundtrack numbers in a movie career stretching back 50 years. Introducing another Medley – this time movie themed – Bacharach points out he’s even appeared in a few movies… cue comic pause… ‘Austin Powers 1, Austin Powers 2, Austin Powers 3. I can’t tell you what being in those movies has done for my career!‘ Still if you written, ‘Casino Royale’, ‘Butch Cassidy And The Sundance Kid’ and ‘What’s New Pussycat?’ you’ve not had a bad career so far. ‘Pussycat‘ unsurprisingly sees a mass break out of ‘Woh Woh Woh Wooahs‘. I was at the gig with my Dad – seeing Burt for the 3rd time – and busy declaring what a shame it is that Bacharach never plays his early compositions. As if on cue the man himself announces a medley of his first four hits, Magic Moments, Story Of My Life, The Blob and Tower Of Strength… ‘these songs don’t sound like they were written by the same person as the rest of the evening‘ he excuses. After a huge version of Bacharach’s unofficial theme tune ‘What The World Needs Now‘, theres just time for Bacharach to lead a giddy crowd in a singalong version of ‘Raindrops‘, although he says he’ll only do it if we all help him out. ‘We All’ are more than happy to provide a fitting end with a loud surprisingly tuneful ‘Because I’m free… Nothin’s worryin’ me‘. Billboard were more impressed while The Guardian proclaimed him not only the sexiest 80 year old but the greatest living composer. Superb concert. ‘For the Children’ is a classic Bacharach orchestral piece, far better than the critics suggest. Like the rest of his music, it will stand the test of time. I am only just turned 18 and a fan of soul,hip hop and jazz. I loved this show though.I wish that Jamie Cullum and Adele got to sing more songs as well. Burt is a very talented man and I am glad I watched this,opened my eyes. Alisha – Glad you enjoyed, did you go or just watch on iplayer? Dr.Dre did some beats for Burts last album so his influence spreads as far as HipHop, not to mention soul and jazz. Martin – I thought what I could hear of For The Children over the racket of chit chat and the bar was beautiful. I didn’t go to the show but I wish that I had.I watched it on your site and I have researched a lot of his songs since then. I watched The Beatles version of ” Baby it’s you” and I do think John Lennon sang the song very well. I am living in the UK but I am from A Coruña in Spain and I am very fortunate that my parents have brought me up to enjoy so many types of music. This show was a new experience to me though and I enjoyed it very much. My sister has a very good voice and I have urged her to watch this show as I feel she would be able to enjoy and learn from it. Thank you again,you really did make my night.